From Melissa Alvarez, co-owner of Top Hat Friesians (breeders of purebred Friesian horses and Barock Pinto horses) comes a new recipe book of over thirty treats that your horses are sure to love. 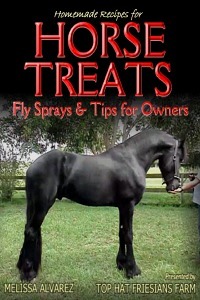 Also included are fly spray recipes to keep those nasty bugs off of your animals and you! There are over thirty tips and tricks for horse owners. This book is packed with information that will save you time and money. Great for new horse owners, beginners and horse owners on a budget!